Signed "Boston Clock Co., Boston, Pat. 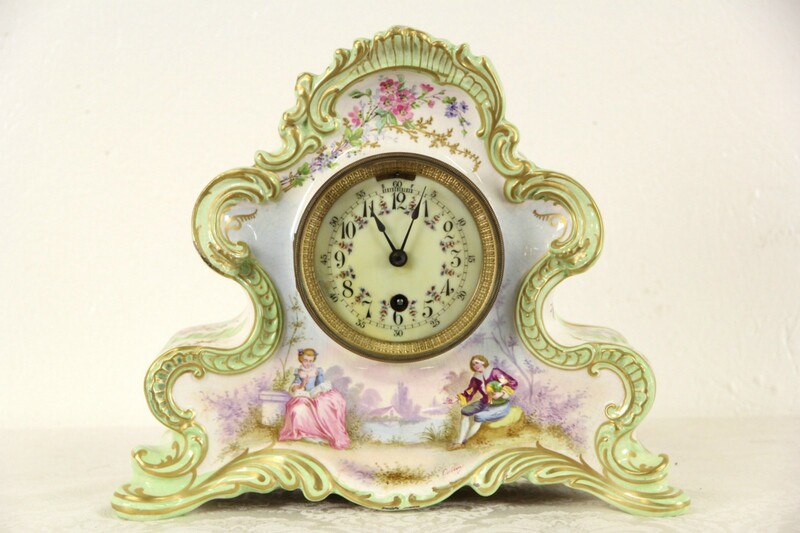 Dec. 28, 1880," this antique porcelain case clock has a very unusual movement. A single wind powers the spring movement and strike. The rare design brass movement has been professionally cleaned and oiled. It keeps excellent time and counts the hour on the hour and half. This patented movement was only made for about a decade by this notable Boston maker. Under a beveled glass bezel, the hand painted porcelain dial is beautiful. The hand decorated porcelain case is signed "Made in France" and is undamaged, the glaze is crazed, see photos. Size is 13" wide, 5" deep and 11" tall.